Are you seeking for ways and means to make your windows pristine again? Would you like to know how to skip unpleasant tasks like window cleaning without lifting a finger? You have chosen the right assistance – the adepts of window cleaning in North Finchley will manage with this matter in short time. Your windows along with their framework and ledges will look perfect, we promise that! You will no longer have to give up your leisure time – the results of our activity will completely delight you. Our services blend top-notch quality with modest price rates, so don't procrastinate – book now to save time, energy and money! We also provide our professional services in nearby areas: Woodside Park, Muswell Hill, Cranley Gardens, Colney Hatch, Wealdstone. We promise that the windows of your business premise will be clean and sparkling, like newly-purchased. Achieve that by just ordering our commercial window cleaning. For windows as high as the fourth floor, we utilise water fed extension pole equipment which is absolutely safe and effective. London is famous for it's tall buildings. So when it comes to those high-rised windows we will bring our rope access team. With this sophisticated technique, we can give you results like no other! You can depend on the cleaners for both domestic and business window cleaning. All types of glass surfaces are included in our professional practice. For instance, you can request a service for cleaning small or double windows, French doors, sash windows, patio doors and bay windows. Besides these, we clean and polish garden window surfaces, greenhouses and skylights. At home or at your workplace, you can always get crystal clear glass surfaces – just phone us! We have the right skills and the right equipment for the assignment. 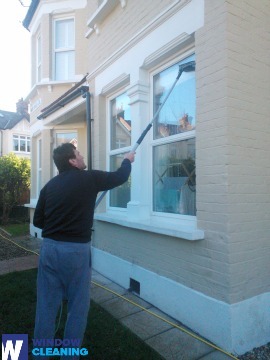 We provide domestic and commercial window cleaning by using advanced methods. You can rely on our professionalism for all types of glass surfaces, skylights and greenhouses. For windows placed as high as the fourth floor, we use water-fed extension poles. This procedure is handy and allows safe cleaning systems – the poles are attached to the water reservoir in the vehicle. For high-rise window surfaces, our rope access option will grant you speedy and great end results. You can profit from these methods right now – just ring 020 3746 3113 and book a visit! Profit from our home window cleaning in North Finchley – we provide five-star services for your home on attractive prices. We use purified water to clean the windows inside and out. We clean from the ground with water-fed pole technology. Contact us now - ring 020 3746 3113 or just use our booking form. Our representatives will help you book and answer any questions. You will appreciate the end-results of our domestic services, we guarantee that!